A dimmer switch lets you manually adjust how brightly your light bulbs shine. Dimming lights is an easy way to set a mood or make your home feel a little cozier. They’re also surprisingly quick and easy to install as long as you have the right tools and directions. 1. Gather the tools you need. Most hardware stores sell a variety of dimmer switches and switch plates. Consider measuring the length and width of the switch you want to replace. Take the measurements with you to the store so you know what to purchase. You can probably pick up any of the tools you’re missing while you’re there, too! 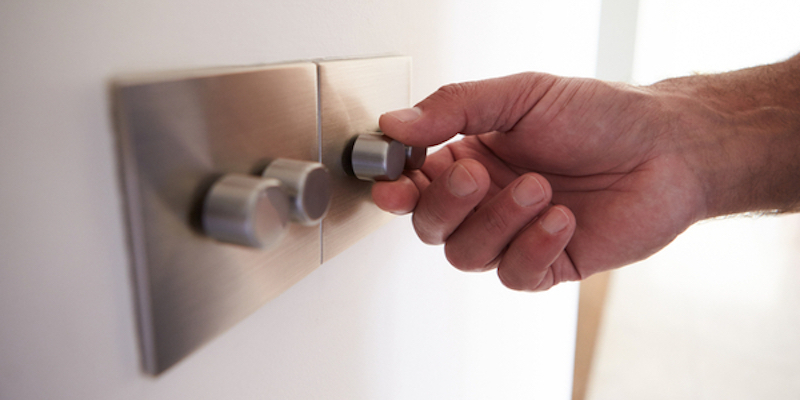 Flip the circuit breaker switch that controls power in the room where you’re installing the dimmer. This is very important; you’re going to be working with wiring and you don’t want to shock yourself! After flipping the switch, confirm that the power is cut off by checking electrical devices in the room. Just to be doubly sure, we also recommend using a voltage tester at the site where you’re installing the dimmer. A voltage tester will tell you if there’s an electrical current running through the wires inside the switch box. If your voltage tester determines that there’s a current in the wire, do not take the next steps. 3. Remove the current switch and switch plate. This is where your flat head screwdriver comes in. Use your flat head screwdriver to remove the switch plate from the wall where you’re installing the dimmer. When you’re removed the switch plate, you’ll see the switch mounted in the wire box. Use your phillips head screwdriver to remove the switch from the box. Next, you’ll need to remove the wires from the old switch. Use your screwdriver to loosen the screws on the side of the switch. You can detach the wires once they’re loosened. Remember or write down wire color and placement position for later reference. Depending on how small a space you have to work with, you may need your needle nose pliers. 4. Attach the new dimmer switch. The dimmer switch will have three wires: black, white, and green (sometimes copper). Remember where the wires were previously attached and reattach them accordingly. Twist the wires until they’re securely attached to the box. 5. Attach the dimmer back to the box and reinstall the switch plate. After you’re safely reattached the wires, fold any excess wire into the box. Be careful when you’re handling the wires. Double-check to make sure you’ve fit them all inside the box completely. After you’ve placed everything back inside the wall, re-affix the switch plate and screw it back in place. When everything looks good, go back to your circuit breaker or fuse box to turn it back on. After you flip the breaker back on, you can test the switch and dim or brighten the lights at will. There you have it! If you follow each of these steps, you should be able to install your own dimmer no problem. Of course, you don’t have to do it yourself unless you want to. If you don’t feel like installing your own dimmer for any reason, give Mike Diamond a call instead. Our experts are always ready to help with any home utility project you need help with.